Ogilvia Pineda Garcia and Kyle Macias arraigned on numerous assault, criminal mistreatment charges. A foster parent and her adult son were arrested July 28, and charged with assaulting and mistreating three young children in their care. Ogilvia Pineda Garcia, 46, and Kyle Edgar Macias, 23, pleaded not guilty to a long list of charges at their arraignment Aug. 2, in the Jefferson County Circuit Court. Pineda Garcia, accompanied by her attorney, Michael Love, and Macias, with his attorney, Jason Munn, appeared by video from the Jefferson County Correctional Facility, where they have been held since their arrest. Security for Pineda Garcia remains at $100,000, while Judge Annette Hillman increased security for Macias from $100,000 to $150,000, after a request from Jefferson County District Attorney Steve Leriche, who said that the grand jury had come back with significantly more charges. Originally charged with seven crimes, Macias is now facing 39 felony charges, including five counts of second-degree assault, which are Class B felonies and Measure 11 charges — which means they are subject to mandatory sentences of five years and 10 months. Other charges include 12 counts each of first-degree criminal mistreatment and third-degree assault, Class C felonies, and five each of unlawful use of a weapon and strangulation, also Class C felonies. When she was first arrested, Pineda Garcia faced five charges; that increased to 14 charges returned by the grand jury, including one Measure 11 crime — second-degree assault. Her other charges include five counts each of third-degree assault and first-degree criminal mistreatment, Class C felonies, and one each of unlawful use of a weapon, a Class C felony, fourth-degree assault, a Class A misdemeanor, and harassment, a Class B misdemeanor. The assault and mistreatment charges are all alleged to have occurred between Jan. 22, 2016, and June 21, 2018, when Pineda Garcia and Macias were caring for the children. According to the arrest affidavit, a deputy with the Jefferson County Sheriff's Office was dispatched to St. Charles Madras on May 26, on a possible child abuse report. The deputy learned from a nurse that a 7-year-old boy had been brought into the emergency room by his foster mother, Pineda Garcia, with a cut on his head that required stitches, and numerous bruises on his back and chest, in different stages of healing. The boy told the deputy that he had fallen onto a wood pile while he was pulling weeds in the backyard, causing the cut on his forehead, and attributed the bruises to playing baseball. The deputy contacted the Department of Human Services and learned that some of the injuries had already been documented, so the deputy took photos and sent a report to DHS. About five weeks later, on July 3, another deputy received a report from the Madras Police Department about possible child abuse, reviewed the earlier report, and became concerned about possible abuse and neglect. On July 9, the deputy learned that DHS had removed the children from Pineda Garcia's home and placed them with the paternal grandmother. The deputy contacted Pineda Garcia and asked about the boy's injuries, and was told that they were from playing baseball, and possibly from falling off his bike. The laceration was supposedly from falling on a wooden pallet. Subsequently, on July 16, the deputy spoke with the boy's coach, who had not witnessed any abuse, and then on July 24, the deputy was present for the interview with the boy at the Kids Center, in Bend. During the interview, the boy revealed that Macias had forced him to eat burned food, punched him and his 4-year-old sister in the stomach, sometimes causing them to vomit; and shoved socks in their mouths, causing their mouths to bleed. The boy also said the Macias had made him take cold showers, had once held his face under the faucet, so that he couldn't breathe, and had covered his face with blankets, also making it hard to breathe. Regarding his foster mother, the boy said that sometimes she punched him, and pulled his hair or ears. When asked about the laceration on his forehead that he had earlier said was from falling on the wood pallet, the boy said that his foster mother had hit him in the head with a glass jar, which broke. On July 28, the deputy returned with a search warrant and arrested Macias and Pineda Garcia. He and another deputy searched the residence and found unfolded socks in the laundry room with spots of blood on them, and shards of glass that appeared to be from the Mason jar cup that had caused the boy's head injury. As one of the children had mentioned, they also found a revolver and two rifles in Macias' bedroom. 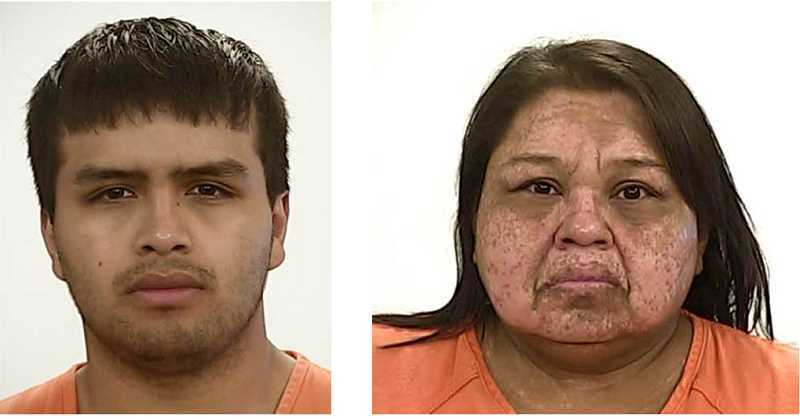 The majority of the charges that Macias face are connected to the alleged abuse of the 7-year-old, but two counts of third-degree assault and two of first-degree criminal mistreatment are connected to the 4-year-old. Pineda Garcia has two charges — third-degree assault and first-degree criminal mistreatment — connected to the 4-year-old. There are no charges of mistreating the youngest child.